That aging shower curtain and shower curtain liner do not always need to be thrown away and replaced. They can be easily cleaned and brought back to like-new condition in no time, saving you both money and time during those occasional house cleaning projects. Just follow these shower curtain cleaning tips! Simply take down the curtain and toss it in your washing machine. Add a bath towel to help with scrubbing the shower liner. Make sure you keep it on the gentle setting to avoid damaging the liner. This method helps remove any built-up mold or mildew, which is very common on shower curtain liners that are constantly exposed to moisture and warmth. Following this suggestion is likely to save you approximately $20 – or the cost of a new shower curtain liner – and will help with the overall impression your shower makes. Another perk: You won’t shudder every time the curtain liner brushes against your body! Cleaning a cloth shower curtain requires a little more care than cleaning a cheap, plastic curtain liner. Remove your shower curtain from the rings. Fill your washing machine with warm water on the largest load setting. Add a couple of drops of detergent and a cup of white vinegar. Toss in your cloth shower curtain on a gentle setting. While your shower curtain or curtain liner are in the wash, take this as an opportunity to clean your shower curtain rings. 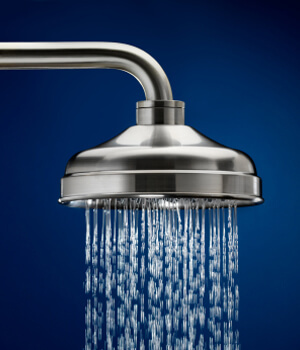 Your shower curtain rings are exposed to all sorts of steam, soap scum and dust – they can get pretty cruddy. We recommend filling your bathroom sink with hot water and a cup of white vinegar. Soak your rings while your curtain is in the wash. Drain the sink and rinse the rings in warm water, using your fingers to scrape off any limescale or soap scum that remains. While Molly Maid doesn’t include shower curtain cleaning as part of our regular cleaning services, we do clean the bathroom from top to bottom. Your shower walls, the inside of your tub, the sink, mirror, countertops, tile floor and toilet – it’s all covered!